After all the preparation, at long last, what started as a casual thought became reality. It was Friday morning the 25th of October and we were ready for the club tour to Shropshire. Eleven of us were going, four junior members Mark Allen, Joseph Langford, Tristan Roberts and Sam French and seven adults Denise and David Hurst, Dean Roberts, Roy Hayhurst, Mary Renshawe, John Cottrell (guest), and Richard Thomas (guest), carrying all our luggage on the back of our bikes. The youngest participant in our group being 15yrs old and the eldest 76yrs old. The mileage on the first two days would be about 55mls and on the third and final day approximately 65mls. We set off in the rain, however, as soon as we had left Congleton the sun came out and it was a lovely day. We cycled via Alsager, Betley, Wrinehill, Madeley, Baldwins Gate, Maer, Standon and onto Eccleshall. Arrival for lunch at Eccleshall was much later than we thought as the puncture fairy had been troubling us. There was so much debris on the country lanes, hedge cuttings and gravel along with the puddles gave us the worst senario for punctures. However we were not daunted by this. 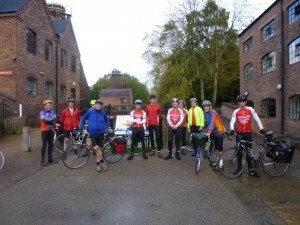 Following a good lunch break we set off, via Newport, Sheriffhales and Shifnal to Coalport, again missing the rain. After nine punctures we arrived at Coalport Youth Hostel at 5pm where they had super storage for our bikes. Everyone enjoyed a really good three course meal and a relaxing evening before retiring. Coalport Youth Hostel was where the famous Coalport Pottery was produced. The Hostel is part of the museum. After a good nights sleep and a full English breakfast we set off immediately up a hill ! The first of quite a few this day, made tougher by the fact that we were carrying our luggage. All of us were hoping the puncture fairy would not return. We cycled to Ludlow via Much Wenlock, Aston Munslow, Diddlebury crossing the racecourse at Ludlow, which doubles up as a golf course. Luckily there was no horse racing but we did have to watch out for any stray golf balls. We had our lunch in Ludlow in a cafe by the castle. We then found a bike shop and stocked up on inner tubes. From Ludlow, we cycled through some beautiful countryside to Craven Arms where we stopped for a short rest, travelling via Onibury and Norton. Then off to Bridges we went, our planned overnight stop, where again we were booked in at yet another Youth Hostel. We cycled via the National Cycle Network route 44, which joined part of the Jack Mytton Way. We then travelled along a gated road at the bottom of the Long Mynd which was very quiet. Within two miles of Bridges, yes you have probably guessed, we had our only puncture of the day. So near and yet so far. Bridges was different from Coalport in as much as it used to be a school many years ago. There has been some modernisation of the facilities in recent years and it was lovely. Our evening meal was again a homemade three course meal. Once again after a relaxing evening and a good nights sleep we set off, homeward bound, after a full English breakfast. Up hill we went. However, we were soon to discover that we had a super following wind, which we had all day, making peddling up the hill and all day, much easier. Again the weather was on our side too. We cycled through some lovely countryside again finding our way over the River Severn at a place called Atcham. We were heading for Market Drayton where we were hoping to meet up with other members of our club, as the club run destination was Market Drayton today. Guess what held us up? Yes, yet again, another puncture. Sadly we did not get to meet up after all. We had lunch at a garden centre in Roden where we sang ‘Happy Birthday’ to one of our junior participants making other people in the cafe smile. There was word out that a storm was coming in during the afternoon, however, we missed that too. Just 18 miles from home, just before we reached Walgerton, the puncture fairy got us again. We asked ourselves was it 12 or 13 punctures? It seemed to be happening to the same people, so they ended up having a competition between themselves to see who was the person with the greatest number of punctures during the weekend. Our first participant arrived home at 4.45pm. Our other participants arrived back at the Rugby Club our club HQ at 5.30pm. We had cycled approx 180mls over 3 days and climbed approximately 3,000mtrs.